The Kitten Academy at Camp Scott was honored by Supervisor Katheryn Barger at the L.A. County Board of Supervisors meeting Jan. 15. 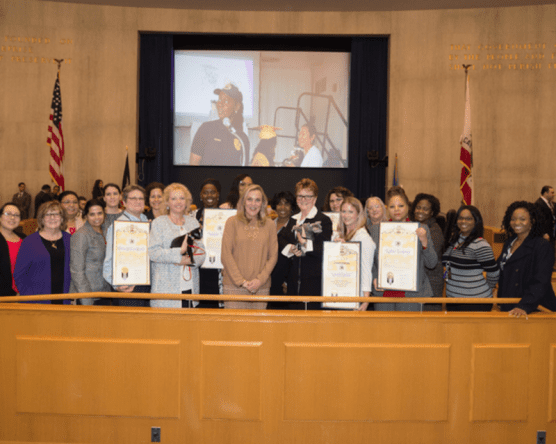 The Los Angeles County Board of Supervisors recognized and honored the Kitten Academy at Camp Joseph Scott during its regular meeting at the Kenneth Hahn Hall of Administration Tuesday in Downtown Los Angeles. The Kitten Academy is an innovative eight-week program that emphasizes the importance of the human-animal bond and its impact on both emotional and mental well-being. The first-of-its-kind approach teaches probation youth new skills pertaining to animal care, as well as an appreciation and an understanding of animal behavior. The program, launched last November as a collaboration between the Los Angeles County Probation Department, Department of Animal Care and Control (DACC), Department of Mental Health, Public Health, Los Angeles County Office of Education and Juvenile Court Health Services, pairs kittens in need of foster homes with probation youth to care for them. The youth provide kittens with the nurturing they need until a forever home is found and each kitten has graduated from the academy. L.A. County Fifth District Supervisor Kathryn Barger was joined by kittens “Knight” and “Winter” as she expressed her support for the Kitten Academy and saluted the team of professionals dedicated to making the program a success for the girls of Camp Scott and the kittens. The kittens cared for at Camp Scott, the only all-girls probation juvenile residential treatment facility in Los Angeles County, are too young to be placed in animal shelters and require special care and nurturing. The girls learn how to feed, groom, handle and socialize kittens that are as young as four weeks old with the help of the Los Angeles Department of Animal Care and Control’s staff and volunteers. The youth are also responsible for monitoring the kitten’s weight and behavior and journal about their experiences. In addition to teaching responsible behavior, the Kitten Academy is providing the girls with valuable training to one day possibly work in an animal-related field. Chief Deputy Probation Officer for Juvenile Services Sheila Mitchell believes that programs like these provide youth with therapeutic interpersonal skills necessary to successfully function in society upon their release from juvenile camp. The first set of kittens, named Pooh, Sky, and Aladdin, graduated from the first Kitten Academy on November 15, 2018, and were lovingly presented to their new forever families by the Camp Scott ladies in a moving ceremony that can be viewed at https://vimeo.com/302098077. We would like to acknowledge the generous grant from PetSmart Charities and Maddie’s Fund that helps us continue this program. Kitten Academy at L.A. County Probation’s Camp Joseph Scott. What a great idea! Everyone wins in this program. Hopefully it can continue.